Life is generally comprised of a series of choices. They come in all varieties, like easy, hard, smart, stupid or lucky. Rarely are we conscious of making choices that are necessarily right, wrong, good or bad. 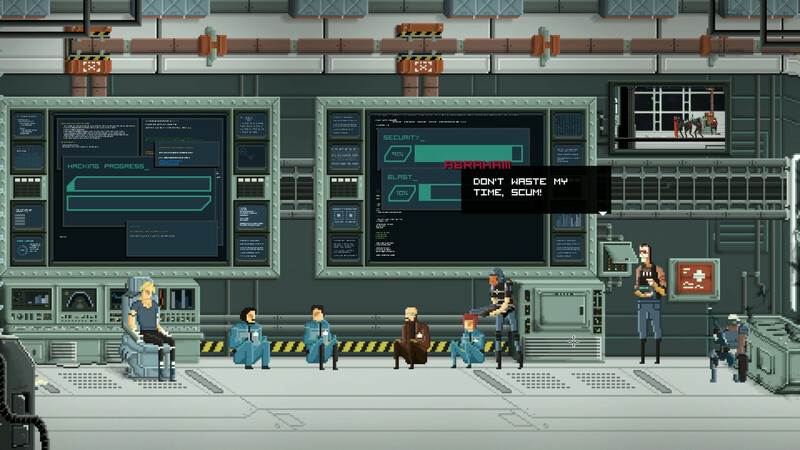 Gods Will Be Watching, a game that's all about decision making, helps cut down the selection. There are no right decisions. There are no good decisions. You're just responsible for picking the best out of a series of bad decisions. In one sense, it's liberating, since there's no dualistic morality scale to judge you. In another sense, it can be infuriating, since certain decision paths will abruptly end the game. 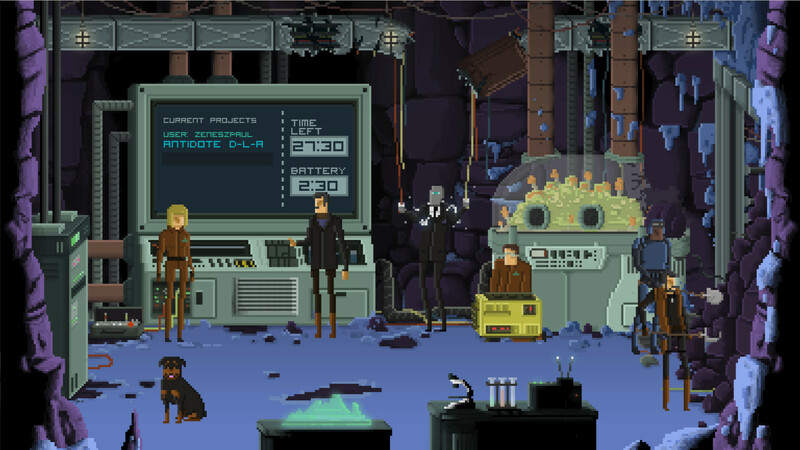 Gods Will Be Watching might present itself as a sci-fi point-and-click adventure game with 8-bit graphics, but it's really more of a strategy and puzzle game with some story elements. The a six-chapter plot technically puts you in the role of a man named Burden. I say technically because you direct the actions of multiple characters, but Burden is the one that has to survive each scenario. He's also supposed to be the guy expected to make the hard choices, which translates into making all the decisions for everyone. It might not sound like much, but the game is so difficult (even when set to easy mode) that it can take hours just to make it through a single chapter. Its gameplay is about balancing out a series of actions in hopes of surviving to the next stage. For example, the first chapter puts you in charge of looking after hostages and keeping security guards at bay while your leader hacks into the computer. There are three objectives manage. Firstly, you have to make sure the four hostages maintain the right level of fear. If they become too fearful, they'll panic and try to make a run for it. In which case, you can either let them go or kill them. If they're too calm, they'll conspire against you and attack, which will cause your partner to shoot them. There are a number of different approaches, each with varying degrees of violence and their own consequences, but no option to knock out or otherwise incapacitate any of the hostages without the danger of killing them. At the same time, you have to make sure the hack goes smoothly by charging up for a power push while fortifying its security to prevent interruption. Then, in addition to THAT, you have to make sure security guards stay their distance by ordering your soldier to make threats or fire off a few shots to drive them back. It's a ton of tasks to juggle, and each action essentially counts as a turn. So, if you take a minute to reinforce hack security, the guards take that opportunity to close in while the hostages progress with their emotional states. There's a sense of compressed time, and it often feels like the hostages can go from chill to full freak out at the drop of a hat. Emotional states are contagious, so killing hostages can cause a chain reaction. Shooting a fleeing hostage may cause more to panic run, and before you know it, you're down to your last person. Eventually, after a multitude of retries, I hit upon the right combination of moves to make it through and realized that this was just the introduction. Subsequent chapters are equally unforgiving. The next scenario has Burden and his friend Jack tied down to torture chairs. From there, players have to decide how much information to give up, if any, or take the punishment while trying to think up a believable lie to buy some time for a rescue. Again, a balance has to be struck. There's no reason to keep you alive if you surrender too much information. At the same time, you could end up dying from the torture while trying to stall for time. Other decisions could get Jack maimed or killed. Or, everything could come down to blind luck. At one point, the torturer pulls out a revolver and challenges you to a game of Russian Roulette. The bullet is a random event. So, if you decide to lie or provoke him, that first shot could be the one that ends you and forces you to restart the scenario. Working through each chapter can be like trying to endure a Groundhog's Day from Hell. Trapped in a cave with a handful of people, a robot, and a dog - each with a specific skill set - the player has to coordinate the group to dig their way out and find a cure for a killer plague. The trick is, you only have each other as test subjects, and injecting a cure not only knocks a character out for three turns, but could potentially kill them. If all that weren't enough, you have to do it all within a set time limit. Although there's no right or wrong way to play Gods Will Be Watching, there sure are a lot of ways to lose. Playing the game requires a certain degree of stubborness that borders on masochism. You have to believe that you can somehow survive a universe that seems like it's out to make your life miserable. But as you get your buddy get torn in half on the rack for the fifth time, or decide which among the group gets to be a guinea pig. The repetition, combined with the 8-bit art, can lead to a degree of dehumanizing detachment. Watching 8-bit characters without facial expressions get their teeth ripped out doesn't trigger an empathetic response from me. It's too obvious that they're digital representations, and not actual people. So, no post Milgram Experiment guilt here. Watching Jack lose his arm was shocking the first time, but not so much the third and subsequent time. Especially after I tried everything I could to keep us both alive and intact. Every playthrough gradually transforms each scenario into a test of patience. Shoot one of the hostages in the leg to keep the others in line, then rescue him before he bleeds out. But rescuing a dying hostage burns a turn. That's when the grim math starts. I need to keep these soldiers at bay, and I really want to finally finish this level, so as long as I keep at least ONE hostage alive long enough to complete the hack, I'll be fine. The rest become expendable. So, focus on one person and let everyone else run face first into blaster fire. Having a team member choke to death on their own blood isn't as horrific after a couple iterations. It's more like a setback that needs to be overcome, since I'd be down one digger and test subject. The full appreciation for the cleverness behind the game and it's design came when I realized that I was casually doing the grim math to "win," which is just progressing to the next stage. I could be as brutal or soft on these characters as I wanted, and it wouldn't make a difference. There was no one to judge or praise me. Successfully completing a scenario brings up a statistics screen that compares your outcome with other players. But it's nothing that made feel better or worse about the decisions I made or feel one way or another about other players, the way The Walking Dead stats screen does. I know that they all tried their best with an impossible situation and the odds stacked heavily against them. Calling Gods Will Be Watching "fun" would be a gross misrepresentation. It's not even an experience that one would necessarily recommend, but it is one worth trying. The game is certainly challenging and engrossing in its way, but I wouldn't necessarily call it fulfilling. More often, the game is almost painful to play, and relief comes when you finally manage to make it through a single scenario. The decisions aren't there to reveal anything about yourself, except for maybe what your sympathetic limits toward virtual characters are as you restart a level for the 10th time. 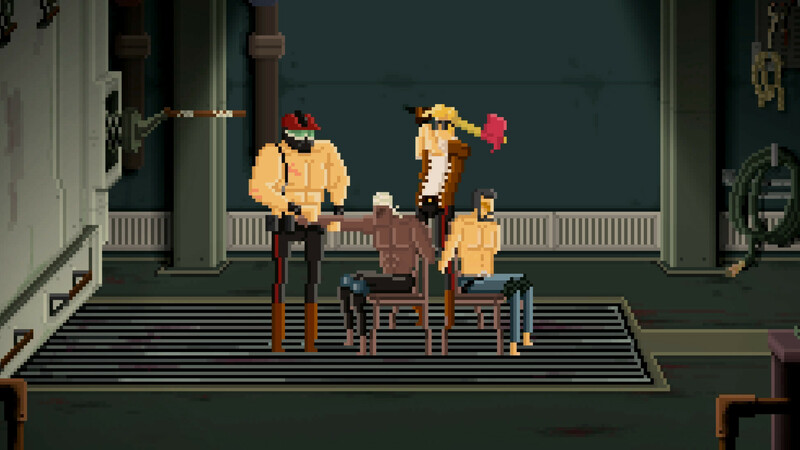 Gods Will Be Watching is more like a gruesome video of a car wreck that you can't tear your eyes from. A not-too-subtle reminder that life is chaotic, and most circumstances are completely out of our control. I started asking: Can I beat the game? How much am I willing to sacrifice to move one inch further than last time? Then there are the quiet moments, like when you're standing outside a bunker and playing fetch with your dog while talking to your best friend (or his ghost). It made me wish there was more fetch, less torture. But I put the stick away and continued forward. This review is based on a digital PC copy provided by the developer. Gods Will Be Watching is available now for PC, Mac, and Linux for $9.99. Steven Wong posted a new article, Gods Will Be Watching review: Uncaring gods looking down.